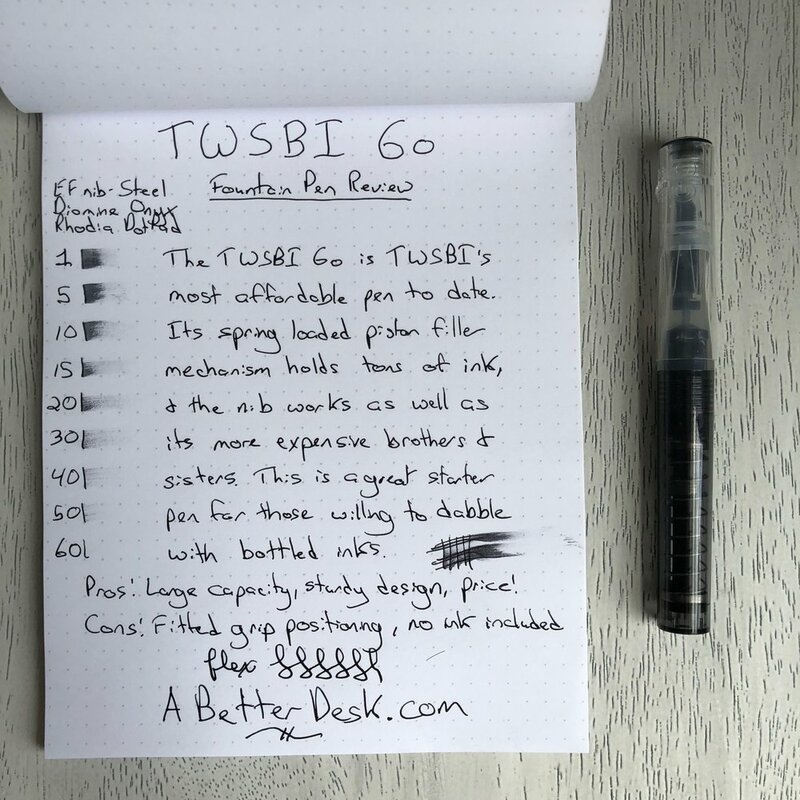 The TWSBI Diamond 580AL is regularly at the top of the list for fountain pens between $50 and $100. In fact, TWSBI is one of the few manufacturers that offers a fountain pen in the price range. I spotted the orange version of the TWSBI Diamond 580AL a few weeks ago, but this version is no longer in production. I love the Dyson-like look of the orange version, but the silver version is a close second. The Diamond 580AL is a demonstrator, so it takes on the character of the ink inside. All I need is a bit of Diamine Pumpkin, and the TWSBI is fit for any Autumn day. I'll be using Noodler's Bulletproof for most of this review, but Diamine Pumpkin just looks so darn good in this pen! Who's ready for Fall? I ordered my TWSBI from Amazon, since the company sells directly via the site. My package arrived a few days later, and I opened the envelope to find a sturdy cardboard box, emblazoned with the orange TWSBI logo. I'm a sucker for orange, and I just can't get over how great this logo looks, especially on the cap of the pen. A plastic display case was padded inside the cardboard. Aside from the pen, the box also included a small wrench, piston grease, and a set of instructions. 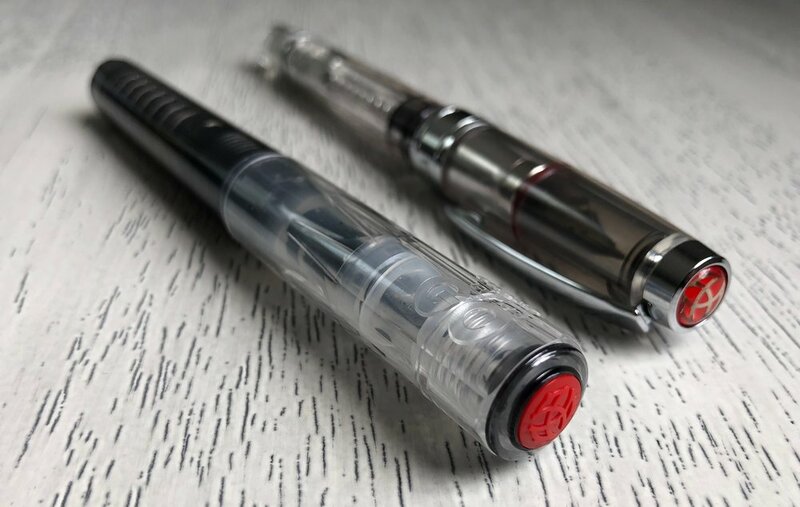 The TWSBI Diamond 580AL is the Aluminum version of the TWSBI Diamond 580. My version came in silver, but TWSBI also offers the pen in purple (not quite my style). The pen is approximately $10 more than the Diamond 580 but comes with an aluminum grip, piston mechanism, and piston housing, which are easily worth the price bump. Apparently TWSBI pens are notorious for cracking, and the aluminum pieces, along with new o-rings in the 580, are meant to address this issue. The Diamond 580AL is larger than the pens that I have traditionally used, and the plastic body has a surprising amount of weight. I couldn't help but compare this demonstrator with my other demonstrator, the Lamy Vista. The orange TWSBI logo on the cap is crisp and high quality, while the Lamy logo looks like a sticker. The TWSBI nib is etched with intricate nib designs, while the Lamy nibs, as usual, are plain. The Lamy is an excellent pen, but it's easy to see where TWSBI spends some of the additional money. The TWSBI clip does seem weak in comparison to the Lamy clip, but the Lamy clip is Hulk-like. The TWSBI Diamond 580AL features a threaded cap, with an o-ring to ensure that the cap is secure. I first experienced a threaded cap on my Kaweco Skyline Sport, and I love knowing that the pen won't accidentally come uncapped in my pocket or bag. Most TWSBI pens come with a piston filling system, which is usually reserved for much more expensive fountain pens. This means that the user simply has to dip the pen nib directly in ink and twist the post-end of the pen to draw in ink, instead of using a cartridge or converter. Most TWSBI pens also have quick-fill ports that can be exposed by unscrewing the nib. TWSBI makes a custom ink bottle that makes it easy to fill via the port . The ink chamber in the 580AL holds a massive amount of ink, and I've used the same fill for weeks now. Twist this piston mechanism to draw in or push out ink. Think of this pen as a giant converter. The TWSBI Diamond 580AL can be posted, but I find it much more comfortable to use when unposted. Posting the pen looks absurd and completely throws off the balance in hand. This is a big negative for me, since it's a pain to keep up with a loose pen cap. The extra length may seem minimal, but it completely throws off the balance of the TWSBI. Aluminum touches add a quality look and feel to the pen, but the aluminum grip section becomes slippery after long periods of writing. I find myself mashing my fingers together to keep the pen grip from slipping. While short spurts of writing are fine, hand fatigue is a common occurrence over longer writing sessions. Noodler's Bulletproof is known for nib creep, but it compliments the beautiful etchings on the TWSBI nib. I ordered the fine-nib version of the TWSBI Diamond 580AL and am positive that I made the right choice. It's worth noting that TWSBI nibs can easily be unscrewed and replaced with different sizes. The pen produces a line that's somewhere between a Kaweco fine and a Lamy fine, both thicker than their Japanese counterparts. There is little nib flex, as is common with most steel nibs. TWSBI nibs are very smooth. I did notice occasional skipping when using my Diamine Pumpkin ink, but had no problems with Noodler's Bulletproof. The TWSBI Diamond 580AL Silver pen is a good fountain pen for the price. I use the generic term "good" because there are several issues holding this pen back form absolute greatness. The slippery grip is the biggest obstacle, since long writing sessions result in hand cramping and fatigue. The aluminum touches are a clear plus, but the few remaining black plastic components and o-rings seem out of place and cheapen the pen's look. The nib did have occasional flow issues with some inks but performs well most of the time. I'd rather forget how poorly the pen posts. Should you buy the TWSBI Diamond 580AL? 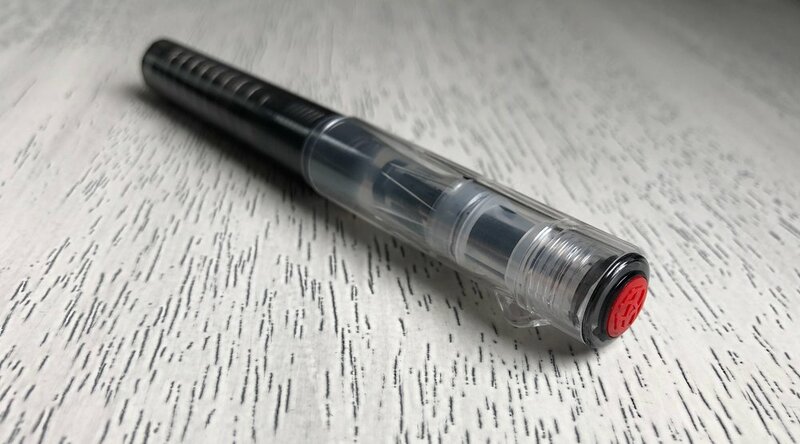 If you're looking for a classy demonstrator with a huge ink reservoir and piston filling system for an affordable price, this very well may be the pen for you. If you're looking for a comfortable writer for epically long writing sessions, you may want to look elsewhere. Thanks for reading til' the end! Like what you see? Please subscribe to my RSS feed, at the bottom of the page, or follow @abetterdesk on Twitter to be notified of new posts. New posts go up every Tuesday, with my favorite links of the week on Sunday, and the occasional bonus post on Thursday. Thanks for stopping by!